2. Any purely theoretical paper that involves “behavioral” theory (for example, non-expected utility). In addition to the monetary prize, the author or representative from the authors of the winning paper will be invited to present that paper and related research at the University of Exeter in the Fall of this year. We would like to invite you to nominate a paper. To qualify it must be published in 2016 and in one of the above-mentioned fields. The date must be the in-print date rather than the on-line date. You may send the nomination via an email to the following address: feelmail at exeter.ac.uk. Please write ‘Exeter Prize Nomination’ in the subject field. Note that you are allowed to nominate your own papers. The deadline for submitting a nomination is May 1, 2017. 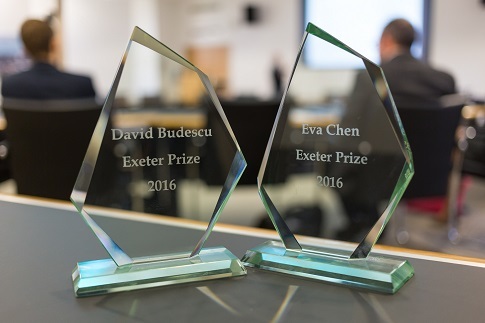 The winner of the 2016 Exeter Prize was “Identifying Expertise to Extract the Wisdom of Crowds” by David Budescu and Eva Chen, published in Management Science. The winner of the 2015 Exeter Prize was “Experimental games on networks: underpinnings of behavior and equilibrium selection” by Gary Charness, Francesco Feri, Miguel Melendez, and Matthias Sutter, published in Econometrica. The winner of the 2014 Exeter Prize was “Temporal Resolution of Uncertainty and Recursive Models of Ambiguity Aversion” by Tomasz Strzalecki, published in Econometrica. The winner of the 2013 Exeter Prize was “A Continuous Dilemma” by Daniel Friedman and Ryan Oprea, published in the American Economic Review. The winner of the 2012 Exeter Prize was “Transitivity of Preferences” by Michel Regenwetter, Jason Dana, and Clintin P. Davis-Stober, published in Psychological Review. Call for nominations: 5th Exeter Prize for Research in Experimental Economics, Decision Theory, and Behavioral Economics was written on March 29, 2017 and filed in Programs.